Pitted against 3A team East Marshall, the 1A-ranked Lynnville-Sully girls found their groove as the game progressed and worked their way to a 51-26 win on Thursday, Dec. 22. The Hawks were at home for their last game before Christmas break. 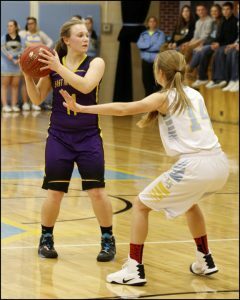 Junior Christine Nikkel guards former L-S student Maria Rasmusson. L-S was up just 11-6 after the first period as the Hawk offense tried to force plays instead of just letting them happen. Then the Hawks put together a 19-5 second quarter and a 17-5 third quarter to gain a significant advantage. Down 47-16 heading into the final quarter, the Mustangs played scrappy and outscored L-S 10-4 in the final eight minutes, but the W would go to L-S, 51-26. The Hawk defense played “pretty good” all night, according to Hulsing. L-S tallied up 49 rebounds (16 offensive) to East Marshall’s 26. Sophomore Carson Fisk pulled down nine rebounds, followed by seniors Brenna Lanser and Jelissa Rozendaal with eight each. The Hawks stole the ball 12 times, compared to eight times by the Mustangs. Fisk had four of those 12 steals. Fisk was also the team leader in scoring with 15 points. Lanser also hit the double digits with 13 points. Junior Mariah Vos connected for eight points, followed by Rozendaal with seven, junior Jataya Meyer with five, and junior Hailey Scandridge with three. Hulsing wished all Hawk fans a merry Christmas and happy New Year. L-S took a 9-0 record into break with the second half of the season starting Jan. 3 at Tri-County.